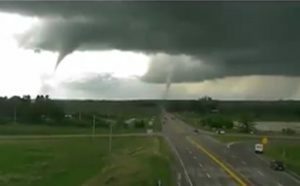 Two tornadoes are spotted in Bondurant as seen from Iowa DOT traffic camera in Altoona. President Donald Trump has approved federal funding to help the State of Iowa, local governments and some non-profit agencies cover expenses related to tornadoes and severe storms that struck Marshalltown, Pella and elsewhere on July 19. Marshall County Emergency Disaster Coordinator Kim Elder said over the next week, state and local officials will learn more details about how these federal funds may be used, but there are some general parameters. The president’s “major disaster” declaration covers Lee, Marion, Marshall and Van Buren Counties. It means the federal government will pay a share of the costs of emergency work state and local governments did right after the tornadoes struck, plus some of the costs of repairing and replacing government and non-profit facilities that were damaged. It does not mean the president has approved federal assistance for individuals or private businesses hit by the storms. A statement from the White House indicates that may happen at a later date if assessments show the damage to homes and businesses is severe enough. Congressman Dave Loebsack also issued a written statement. (DES MOINES) – Gov. Kim Reynolds received word Wednesday that President Donald Trump has partially approved her request for a Presidential Disaster Declaration for counties impacted by severe storms and tornadoes on July 19, 2018. The declaration will make assistance available to public and nonprofit entities in Lee, Marshall, Marion and Van Buren counties under the federal Public Assistance Program. A Presidential Disaster Declaration for Public Assistance puts into motion long-term federal recovery programs, some of which are partially matched by state programs and designed to help public entities and select nonprofits. Public Assistance funds may be used for emergency work and the repair or replacement of disaster-damaged facilities and may include debris removal, emergency protective measures, repair of damaged public property, loans needed by communities for essential government functions and grants for public schools. Damage assessments in the four declared counties showed an estimated $6 million worth of damage that could be eligible under the Public Assistance Program. The governor also received notification that this Presidential Disaster Declaration will make available funding to conduct hazard mitigation activities for the entire state. With this funding, Iowa will be able to minimize the impact of future disasters by taking steps to reduce or eliminate long-term risk to people and property from natural hazards. Still under review is the governor’s request for funding under the federal Individual Assistance Program for homeowners, renters and businesses in Marshall and Polk counties for the July 19, 2018, severe weather and tornadoes. Federal Individual Assistance Program funding provides disaster survivors with programs and services to maximize recovery, including assistance with housing, personal property replacement, medical expenses and legal services. The governor requested the declaration on Aug. 17, 2018. This is the second Presidential Disaster Declaration granted to Iowa this year. On Aug. 20, 2018, President Trump granted the governor’s request for Public Assistance Program funding for 30 counties impacted by flooding and severe weather from June 6-July 2, 2018. Gov. Reynolds had also requested Individual Assistance Program funding for four counties impacted by flooding and severe weather during that same time period. Her request was denied on Aug. 22, 2018. The governor submitted a letter of appeal to FEMA on Sept. 11, 2018, asking that they reconsider their denial. FEMA’s response to the governor’s appeal is pending.